This stunning home provides breathtaking water views from every room. Live oaks and double porches welcome you home. The house offers an open floor plan with thoughtfully selected, luxurious finishes throughout. A grand living room opens up to an expansive marsh-scape and blue skies from your private spot off of Clark Sound. In the heart of the home is a chef's kitchen boasting cork flooring imported from Portugal, custom cabinetry, high-end appliances, and an abundance of storage. Just over the built-in cook bookshelves is a bright dining area and wet bar, ready to host your next dinner party. Floor to ceiling sliders open up to the 68' deck, expanding the length of the home. The downstairs master bedroom continues the theme of expansive marsh views and durable hardwoods, with a generous walk-in closet and an elegant custom bathroom. Two vanities, a deep soaking tub, large walk-in shower, and artful cork flooring are just a few of the highlights in this beautiful master bath. The inviting second floor greets you with an airy landing that can be used as a reading nook or TV room. Off the landing you'll find the second master bedroom, overlooking the natural surroundings. Both upstairs bedrooms have their own large full bath. On the ground floor, an enclosed two car garage provides ample room for up to 4 vehicles or a small boat. There's a neighborhood boat ramp that gives you access to the endless Lowcountry waterways. 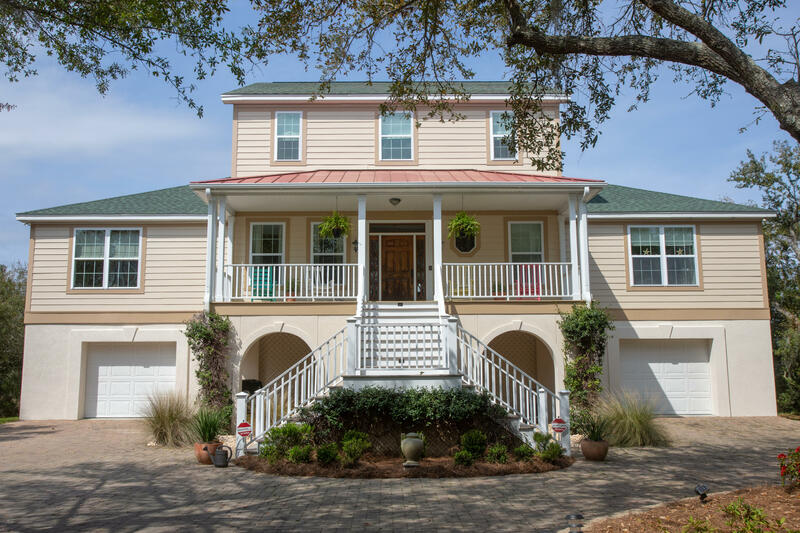 This home is minutes to the beach and conveniently located close to downtown Charleston.